April is National Credit Union Youth Month. In honor of this, we are going to talk about some of the ways that you can get your kids started down the path to a solid financial future. One of the most important aspects of anybody’s finances is saving, which can be difficult, even for adults. Starting now will help your child begin the foundation that they can build their financial future upon. Making smart money choices doesn’t have to be boring. If there’s something specific that your child wants to buy, create a savings chart for them. Every time they hit a savings milestone, there can be some sort of reward. This could be as simple as a sticker all the way to matching the amount they have saved. If your child is new to saving, start with smaller, more attainable goals to prevent discouragement and then work your way up. 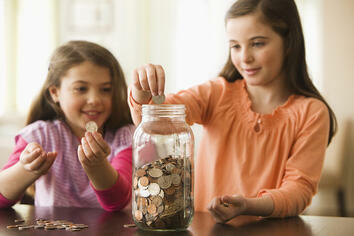 You can start teaching your child the importance of budgeting early in their life. Obviously this doesn’t mean sitting down with your 5 year old and creating an excel sheet, but you can use more visual methods. A good way to represent budgeting is by getting three different jars labeled ‘savings,’ ‘spending,’ and ‘sharing.’ Anytime they receive money, split it between these three categories as you see fit. A Dollar Dog account from Cyprus Credit Union is the perfect way to teach kids 12 and under the value of saving money. To open an account, just bring your child, their social security card, and at least $5 for the initial deposit to any of our branches. All children and grandchildren of our members are eligible for this type of account. Kids will get a free gift upon joining and every deposit of $10 or more will earn them a dollar dog stamp. Once a child hits ten stamps, they can select a $10 gift card to some of their favorite stores.